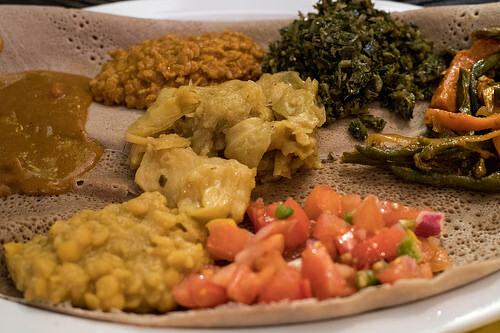 Delicious, healthy, and affordable come together at Meleket Restaurant, a family-owned Ethiopian-Italian restaurant in Silver Spring. Using only fresh produce, the seasonal menu at this innovative eatery features an array of tasty options. The Timatim Fitfit takes pieces of injera and mixes it with fresh tomato, onions, green peppers, and homemade dressing. The Meleket’s Special Tibs is a savory option, marinating tender cubed lamb or beef in tomato, jalapeño, and fresh garlic. Steak lovers will want to try the Special Kitfo, an Ethiopian steak tartar seasoned with an herbed butter sauce and hot chili powder. The bar menu at Meleket features a variety of wine, beer, martinis, and signature cocktails. The Barbados Surprise is one such cocktail — a colorful combination of grenadine, orange juice, rum, and Blue Curacao. Live jazz events are also held in the bar, adding to the relaxing environment of this one-of-a-kind restaurant. Early risers may also want to check out the breakfast menu, which is available from 8 a.m. until 11 a.m.